Easter Peeps come in bunnies, ducks and pretty Easter colors. They are great for making treats and favors for kids birthday parties. Use sprinkles to match your party theme. We found this cute idea from Love From the Oven and had to try some too! They are cute and easy to make. Perfect for any Easter party or if you are celebrating a birthday around this time of year. 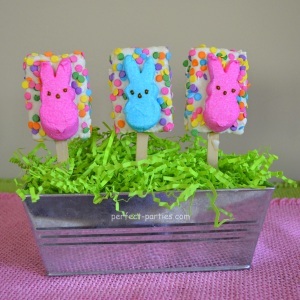 If you have other Easter Peep ideas, please share yours! While chocolate is melting, cut bunnies in half lengthwise and place on waxed or parchment paper sticky side up. They will reform as they sit there. Unwrap Rice Krispie treats and stick a lollipop stick or popsicle stick into each treat halfway. Spoon chocolate onto top of Rice Krispie treat and smooth chocolate until the entire top surface is covered. If chocolate starts to thicken, add a teaspoon of Crisco or shortening to the chocolate and mix. Place bunny on the chocolate covered Rice Krispie treat. 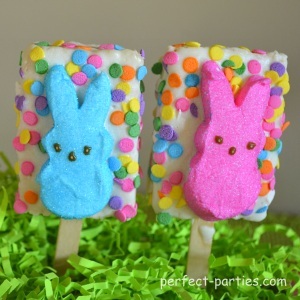 Shake sprinkles onto the top of the Rice Krispie treat around the bunny. We used a serrated bread knife to cut the bunnies in half. They looked too big when we tried whole bunnies.